What Is Metadata And Why Is It So Important For You? How does metadata work with SEO and books? Metadata is text that is written and added to web pages specifically for computer systems and search engines to be able to understand the page content. It is used for blog posts, articles, website pages and listing services such as book retailers. It contains any information that is important for a web page such as location, publishing date, color depth, file type or even store opening hours. Metadata can be created in many ways, but generally, document metadata describes the page title and SEO description. Other instances of metadata include dates, locations and star ratings. It is sometimes called internal metadata because regular page visitors cannot see it. When you do a Google search, you will see meta tags in action as the page title and description for each search entry in the list of Google search results. Here is the Google Search result for this article. The purple line is the article’s meta title. the green line is the URL. The black text is the meta description. The orange stars and rating score are also metadata. Metadata creation is what drives search engine optimization (SEO) so it is important to take the time to learn how to use basic SEO practices not only for your website and blog posts but also for your books. There is no mystery about it, other than the fact that it is a vital part of information technology, and that metadata is data but you can’t see it on a web page. It is utilised to summarize basic information about data which a search engine uses when it indexes pages. Book metadata is in the end, what really sells ebooks, so you need to know about it. So what is book metadata and what does it do? If you are an author and self-publishing on Amazon, Kindle, Smashwords, Draft2Digital, Apple, B&N or anywhere else, you need to know what book metadata is, and how to use it to help sell more books. Take it from me, as an author who has been chronically lazy and left many of my long list of previously published books unchanged from the day they were published; times have changed. And how. I have been booted into action, however, because, well, um, here comes my admission. Because my book sales were falling, and I know why. I have not made it easy for readers to find my books. No matter how many great reviews my books may have if readers can’t search and find my titles on retail sites, how can I hope to sell more books? The word metadata may sound technical, but in reality, it is very simple, as it is only about words and phrases that will help readers find your books. For the sake of simplicity, I’ll use the example of what can be added to an ebook on Kindle Direct Publishing, but it will work almost exactly the same for all other publishing platforms. Book data is what Amazon and search engines such as Google use to list your entry (book) so it can be found by people using the search feature on Amazon, or on Google Search. There are defined fields that hold instances of your data. There are metadata standards for books and ebooks. Book metadata includes the title, subtitle, series title, author, contributors, book description, categories and keywords. For Amazon KDP, there is also Age Range and United States Grade Range. These can be created by using all of these fields, and they will be indexed and used to make your book and data easier to find online by book buyers. While it will take me some time to do the necessary research to update all of my books, and in particular in selecting keyword phrases, I have noticed that after modifying the data on only one of my books that changes in the way my book is listed happened immediately on Amazon. Firstly, instead of my ebook appearing in only the two general categories, it is now listed in four. This is because I chose keyword phrases that were already listed in the Kindle Store. Whereas before I had selected espionage and spies as separate keywords, by combining them into espionage and spy thrillers, which was suggested when I typed espionage into Amazon’s search field, it gave me a search term that has been used before by book buyers. It also suggested, wartime espionage and military and spies, which I also used as keyword phrases. By making these two simple changes to my keywords, I now have four genre listings. Even better, now when someone searches for wartime espionage, my book, Louis, is listed at number 4! This is the power of metadata. My previous keywords had my book listed at the wrong end of 1,000’s of books, so it was almost impossible to find. My seven new keyword phrases now get my book up into at least the top 20 search listed books. Because the selection of your seven keywords is so important, you should take the time to find the best possible choices. You can do this for free using the Amazon search pane. But if you really want to dig deep and find keywords based on low competition and high search volume, you should consider a pro tool such as KDP Robot to help you. With this tool, you can dig deep into high-value keywords, better categories and also check sales data on competitive titles. If you look at the image below, notice the categories listed on the left. These are the keyword phrases that can become new category listings for your book if you use them as your keywords, and really help in making your book more discoverable. The other change I made was by adding a subtitle. As this is again searchable data, it helps readers find your book. As my book title, Louis, says little and is not going to be found by search, adding the subtitle of, The Life Of Real Spy, guides readers interested in the spy and espionage genre towards my book. The most difficult change for me was in rewriting my book description. Although it needs to contain all the normal SEO norms such as repeating keywords from the title, subtitle, perhaps series name and using some SEO power words, it should NOT include the words and phrases used in the categories. This is a bit weird, but as I have researched, it is a peculiarity of how Amazon uses document metadata. Lastly, the choice of categories is very important but limited to only two. Select wisely, but avoid using general categories such as romance or science fiction. Start by looking for one category that provides information more relevant to your book. In the book I have changed, I selected FICTION > Thrillers > Espionage and FICTION > War & Military in place of my old categories of FICTION > Drama and FICTION > Historical. Dig deeper to find two, more specific categories for your book. Now, does all this work? Yes, it definitely does help in making your book more discoverable online by making your data easier to find. One other important factor to know is that if you don’t get it right first time, you can try again, and again, and again. Experiment to see what works or doesn’t work. It could be as simple as finding just one golden keyword phrase, changing a category or editing your book description that will make your book more discoverable and hopefully, improve your book sales dramatically. While I would not suggest that improving your metadata alone will magically increase book sales tenfold, it should be considered as one vital part of your package of book promotion strategies. The Internet and information technology, in general, run on metadata, which is sometimes called the semantic web, so it is important to have a basic understanding of how metadata works. It is used to summarize basic information about other data on a web page. 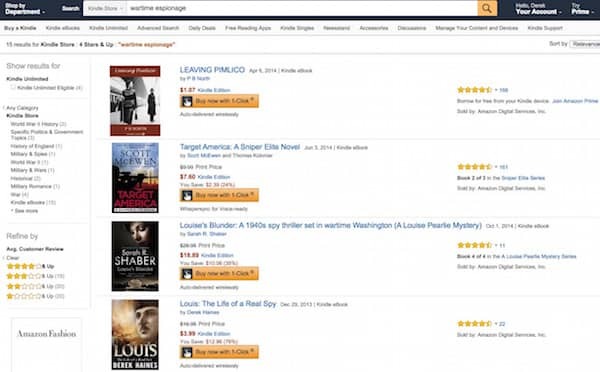 Your book sales page on Amazon is a web page, so it describes your book in brief to search engines and Amazon search. In the end, it is what attracts buyers to your book, so yes, it is very important for you. Using a link at http://writerswin.com/metadata-importance-authors/ I found out that the ISNI that was created for my book from the Library of Congress records had misspelled the title. I sent correction messages to the agencies involved. What about making sure the file name of your manuscript matches your title/subtitle, does that make a difference like it does for Youtube? I’m not sure, Emeka. However, it is always good practice to use appropriate file names.